I had two ripen bananas at home that need to be used up by tonight. While the double chocolate muffins with yoghurt is baking in the oven, I quickly gather all the ingredients needed to make this muffins. End result is, Jonathan popped three at one go when they were cool enough to be eaten. The texture is soft and the cinnamon smell is nice. Recipe shared by Wink also. salt, and cinnamon and set aside. 3. Fold in flour mixture into the liquid ingredients until combined. 4. Fill greased muffin tins two-thirds of the way full. Note: I made some changes to the recipe. I used both brown sugar and castor sugar for this recipe to make up 140g. I added 1 tsp of cinnamon powder instead of 1/2 tsp. Have bookmarked this as my urgent to do list, cos my younger daughter loves everything bananas. Dont know why twice I made muffin, it expanded and overflowed. I try to lessen the batter in the muffin tins but it was like filling half only .. still overflowed. What kind of muffin tray did you use? For the two muffins recipes that I have just posted, I spooned the batter to almost full in the paper cup and it did not overflow. Yummy.. quite long I never baked this kind of Muffin, bz with others things.. It's me again. Thanks for the recipe. Was looking for nice banana muffin recipe. Just one question, would it be alright if I don't add the cinnamon powder? May i know how to get 1/2 cup of margarine or butter? What is UHT milk, can i replace with fresh milk? Hi panda q, omit cinnamon powder if you like. No problem. Hi Candy, 1/2 cup margarine or butter is about 113 gram (1 cup is 225 gram). 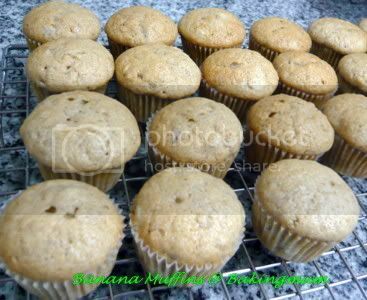 Very nice banana muffins, can you please let me know how much is 2 cups of all-purpose flour & 1 cup of mashed ripe banana in gm. Thanks. Hi Delphine, 1 cup of flour is about 125g. For the banana, I have not measured so not too sure. Thank you for your advise & prompt reply. Thank you. Tried baking the muffins. It turns out good. Right taste and moist. Will be posting some pictures of it on my blog. Can you replace UHT milk with fresh milk ? what's the purpose of UHT milk? Yes you can use fresh milk in place of UHT milk. The purpose of the milk to make the muffin moist. Yes cream butter and sugar until fluffy and creamy. Hi Hugbear its me again..
About the sugar can I use brown sugar? What I mean is I will use 3/4 cup brown sugar? And is it okay if I'm going to omit the cinnamon powder right? Can I put walnuts and white chocolate chips?? ?